As my cosmetics stash gently ages (see previous Rambles...), I feel I should rethink what it means to have a stash to begin with. I've never been much of a "collector" in the sense that owning a lot of makeup, for the sake of owning it, has never appealed to me. By this I do not mean that owning a lot of makeup is bad. It can be very good, as long as you find a purpose for it. If I had use for two hundred lipsticks, I would own two hundred lipsticks. And I would love each one. But two hundred lipsticks is not "me." One or two lipsticks is becoming, more and more so, "me." That could be seen as next to insane in this era of thousands upon thousands of lipsticks, but, again, a stash is personal, and must be customized to the customer. So far a close candidate for the One or Two Lippy Policy is Chanel Moiré. It looks nothing like that little swatch btw. Moiré is a luscious blend of many colors, starting with a warm, brick red base, laced with plum, rose, a bit o' brown, a twist of fuchsia shimmer, altogether Your Lips But Better, but not as bland as some YLBB shades tend to be. Why Moiré, well it's the only Hydrabase I've tried. I would probably investigate the other Hydrabases before plunking down anything. Nars. Which Nars? I have no clue. Unlike MAC, Nars is a brand not incessantly photographed. The price of Nars is comparable to Chanel's, so again I would investigate before buying. Those are my two candidates, when my MAC Strawberry Blonde lipstick gets used up. I'm leaning more toward Nars than Chanel, if only because Nars lipstick is the "evil I never tried before." 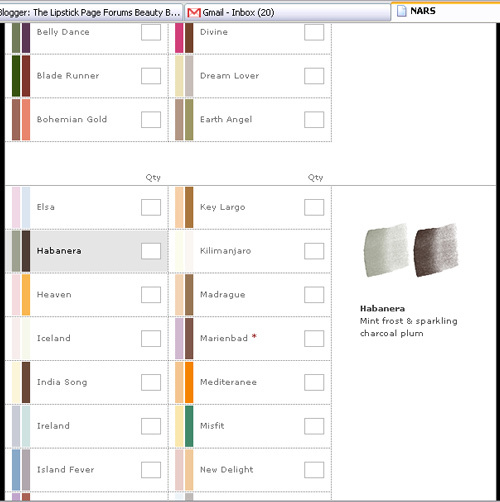 Now, eyepencils...what I have: MAC Powerpoints in Permaplum, Grey Utility, Bordeauxline. MAC Eye Kohl in Heirloom. Prestige waterproof automatic pencil in Expresso. Expresso is genuinely getting old, I've tried wiping a few layers off with a tissue; it's still difficult to get a good thin line out of it, or blend the line I do get. It's a good brand...easily the best drugstore eyepencil. But I'd like something more special in terms of color. Enter Urban Decay 24/7 eyepencil in Bourbon. Bourbon would appear to be a brown pencil swirled with gold, perhaps a bit of red; all that good stuff. I'd have to swatch it, but basically I'm looking for a brown eyepencil that would go with all the eyeshadows that brown eyepencils go with, but be special enough to be worn on its own. 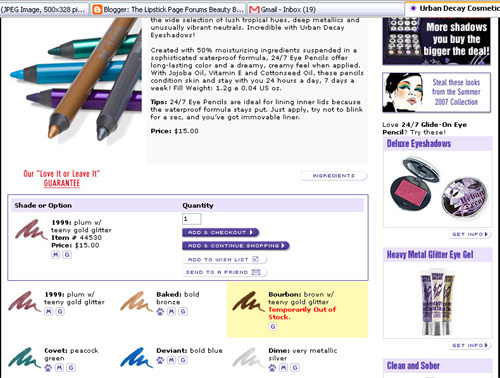 I'm not in a hurry to replace my MAC eyepencils as the quality seems to be holding out, but if Bourbon works out, I might look at the purple 24/7's. Blush...more than happy with Nars the Multiple in Malibu. "Pinkish brown"...eh...does not do it justice. Malibu is a bit warm, a bit bronzy, essentially a deep rose color. It functions as part blush, with an element of a bronzer. You can use it as eyeshadow or lipstick...I don't, since I have better eyeshadows, and as a lipstick, it's too dry. As a blush, it transforms. Can't ask for more, there. Eyeshadow. Now here I must echo Dain. You've got to replenish your Nars duo eyeshadows periodically. They do pay for themselves; the duos I acquired three years ago are still going strong, still look perfect, still...inspire. Habanera is the "obvious" choice, if only because it's different. Not "different unwearable," from what I can glean (never seen it in person), but "I can create something amazing" different, "how did she do it?" different. But I'll probably end up getting something else. Forget it, Jake. It's Nars. Okay so that's it for color cosmetics for me. I don't wear mascara, don't wear eyebrow products, don't do gloss or lipliner (shhhhh...). For that matter I don't do concealer, have no interest in full coverage foundation, have never actually worn liquid eyeliner. I need a few color cosmetics to keep me entertained/make me look good when I need to look good...the products have to perform, have to elevate, otherwise why bother? I have a Chanel lippie and I also have a NARS. Colorwise, the NARS rocks, but the formula stinks. Its drying. Really,really drying. Which is fine, cause its a red and so it wears like iron and does not move. But it is drying. Good for special occasion wear, not so good for everyday use. I have ultra-sensitive lips though, so maybe the NARS won't bother you. I would definitely buy another Chanel, but I wouldn't repurchase another Nars lippie. Hermmmmm... I had heard that about Nars lipsticks. Not sure if they're all like that, or if some formulas are drier than others. That's the bugger about Nars, there isn't much consumer info about it on the Net. There's an overload o' MAC, but next to no Nars. 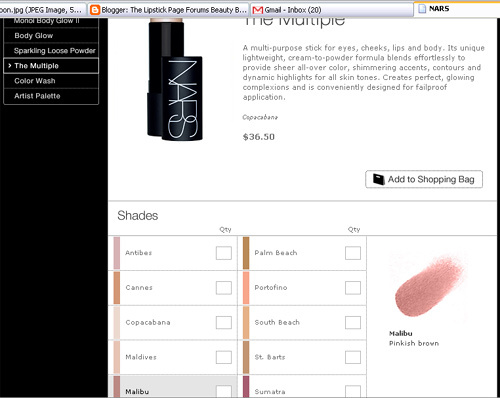 I'm game to try *a* Nars lippy, most likely one of the sheers. If the sheer is dry, that will likely be the last Nars lippy for me. I don't do dry too well. 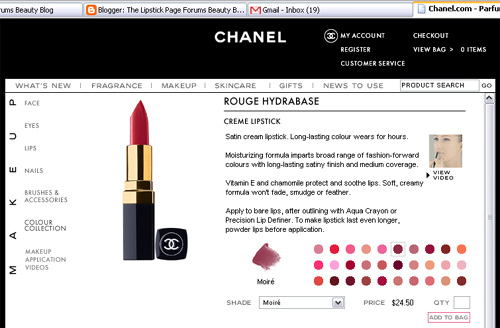 The Chanel lippy I tried was the Hydrabase formula, and it was good. It felt dry on the surface, but kept my lips really soft.